+5 mod damage to all attacks and class abilitiesResourceful [Passive]: Grants an additional use to every class ability. Noble: You were born into the upper echelons of society, either in the great noble houses of your land or the head of your tribe. Your position in life is to lead and give stability to your people. Without you, the world would not have order. Born Leader: While your character is alive, players within 10ft of your character have -2 threshold for CC checks. (Does not affect self) "Your presence inspires those around you." Heraldry: Your character is well learned and know the key political players in any court they are in. They may choose to employ this knowledge on a single character during an event. (DM assisted knowledge to allow you to assist the players on the background and personality of a specific NPC) "You naturally know the politics of the land." Lay of the Land: Increases your character’s perception rolls by +10. Allows them to reroll a perception roll once per event. They will keep the second of the two rolls. "You know local superstitions, trails, and culture." Nature's Gift: Your character has a +4 to nature based challenge checks. "You are one with nature." Animalistic: You may calm hostile non-boss beasts by rolling a Nature challenge check. "Animals have a natural affinity to you." Small: Your character is able to move through enemies even when there is no space to move around them. "Your miniature size does not discredit your usefulness." Arcanic Affinity: You have a +4 to Arcane based challenge checks. "You are naturally gifted with Arcane magics." Violent: Whenever your character enters a situation that becomes overly tedious, they must roll a violence check of 1d4. If they roll a 4, they will then violently attack someone present. "You crave bloodshed." Stubborn: When using a social challenge against a character, you can only use that same social option against that character for the remainder of the event. "There is only one way, your way." Claustrophobic: Whenever in a dungeon crawl your character has -2ft to their vision and -15 to their walk and sprint. "Tight spaces make you uncomfortable"
Weakness to Shadow: Your character suffers a -8 to shadow challenge checks. "Your body cannot handle shadow magics." Weakness to Fel Rank 2: Your character cannot pass fel based challenge checks. 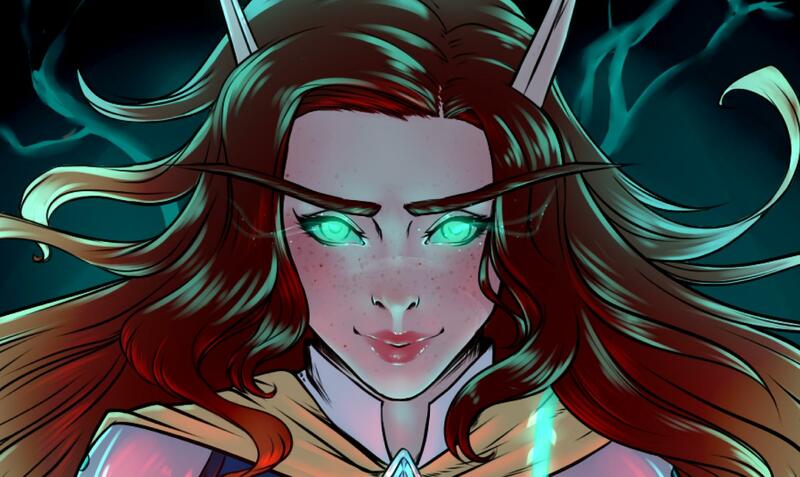 "Your body cannot handle fel magics." Traumatized: Whenever your character is less than 50% HP, they must pass a fear CC check of 1d20>12 to prevent them from being feared for one turn. "Your past still haunts you." The Natureward holds deep respect for the natural world, having forsaken material culture and society for the peace of earth. They are the arbiters of living energies that cannot protect themselves. With their fortitude bolstered by the environment, they exact primal attacks and strikes against their foes.Bonus: +10hp. Increases Perception and Initiative by +20. With the destruction of House Silvermourn, more traditional teachings of druidic nature have begun emerge from the woodwork in Oakhall. These old Quel’dorei hid away within the hundreds of burrows inside the great forests of Oakvale. Half religious zealot, half avatar of nature itself, the Oakvale Warders wish to share with the world their sacred arts of druidic magic. With them comes their powerful allies, the ancients of the forest who have remained hidden for so long. Nature’s Will [Passive]: Your standard weapon strike is replaced with a brutal melee attack for 2d20+10. This ability does not deal critical damage. Applies Maul for one turn upon the attack. Impale: Minor Action(can also be used with other minor actions on a given turn). When used while attacking an enemy target, they may also strike any enemy unit(s) within 10ft directly behind that original target. Maul[Passive]: When attacking enemy targets, the Natureward will apply a bleeding dot onto them dealing 1d8 for the next two turns. Nature’s Grasp: Roll 1d3 when dealing damage with a weapon or basic offensive spell. If you roll a 1, then the enemy takes 1d7 damage and is rooted in place. Wildheart: The Druids shifts into its animal form for the next three turns dealing an additional +2 die to its basic attacks. This is a minor action. Swipe: For the next three turns, the druid will gain a cone template for their basic attacks dealing damage to all enemies within the template. This is a minor action. Faerie Fire: The Natureward bathes the enemy unit in faerie fire dealing 2d15+5 fire damage and making them unable to stealth. Act IV Veteran: +1 Commander Point (Earned for participating in Act IV: The Winter of Woe). Alchemist: Extra potion slot. Awarded to Sunguard raid team for clearing Blackrock Foundry. "You are well stocked in herbs"
Versatile: Adds the trait of Versatile, which allows players to pick a skill from another class. Awarded to the Sunguard raid team for clearing Hellfire Citadel. "You are very deft at learning skills from other professions." Avatar of War[Passive]: Whenever the Ancient of War kills an enemy target. They may roll 5d10+15 to heal themselves. Bonus: For one turn add an additional die onto your basic attacks for this turn. Bonus: Add a 30hp shield. May be used as an instant. Bonus: +5 max and mod damage. Grants the Vanguard trait, allowing the unit to position themselves on any edge of the map on the start of the second turn. Bonus: Increases the mod damage by 10.